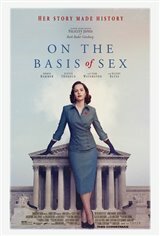 During a time when women were expected to stay at home and take care of their husbands and children rather than hoping for careers, Ruth Bader Ginsburg (Felicity Jones) decides to become a lawyer, even though she's discriminated against wherever she turns. She graduates from Columbia Law School, wanting to fight for freedom and gender equality. However, she has trouble getting a job due to her gender, as men who are less qualified get positions instead. She teams up with her husband Marty (Armie Hammer) to bring a groundbreaking case before the U.S. Court of Appeals — one that could turn around years of discrimination and give young women a future full of hope.